Wolffpak: Levi - Now Five! 2. Brought individual bags of Cheetos to his classmates. 3. Ate an individual cheese and sausage pizza. 4. 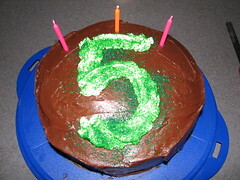 Shared a yellow cake, with a green five and chocolate frosting. presents-a yo-yo and a slinky. How can you NOT love him to pieces.